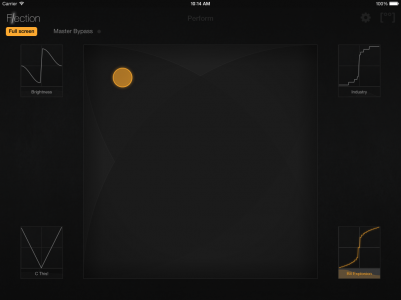 Flection is the ultimate waveshaper for iPad. Select one of the more than 30 base transfer functions and adjust it with exceptional accuracy and flexibility. 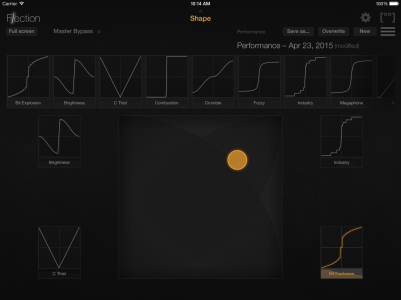 Use the pre-equalizer for additional frequency-specific shaping. No less than six different real-time audio visualisations (including spectrum difference view and I/O audio histogram) give you a complete picture of the audio before and after processing. 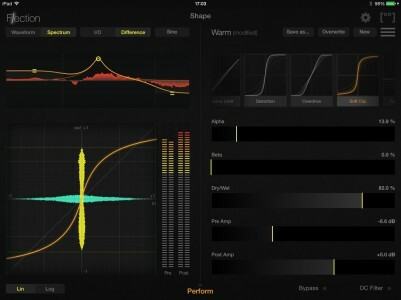 Mix between your four favourite shaping presets in performance mode. 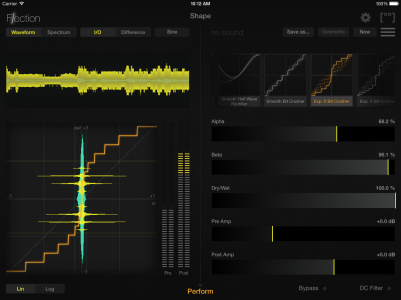 Full Audiobus and Inter-App Audio compatibility allows for the interconnection with other iPad apps. 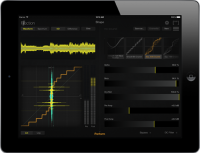 Flection is an advanced precision tool for shaping your sound. It offers high quality stereo audio processing at very low latency, flexible control and multifaceted visual feedback. 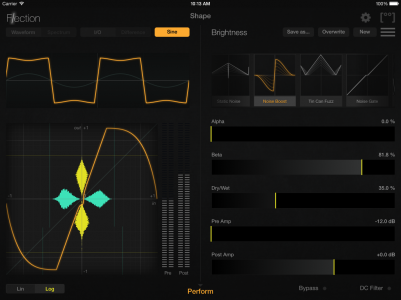 Waveshaping is typically known to work great for guitar distortion, but you can use Flection just as well to spice up your drums, mangle your vocals or enhance your synths. Flection’s principal view is the Function view, in which you can see and modify the current transfer function. 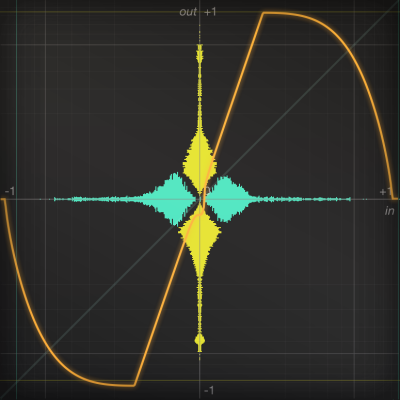 Behind it is a real-time I/O audio histogram that visualises the input and output amplitudes. Flection also offers real-time I/O waveform and spectrum views, as well as difference waveform and spectrum views for optimal monitoring. The spectrum views offer control over a 3-band graphic pre-equalizer to boost or attenuate specific frequencies before waveshaping. If you have any comments, requests or bugs to report regarding Flection, please contact us. Do specify the iOS version you are using.